theimps.ka - Part 2 of "In Conversation with Jamie Forrester"
Part 2 of "In Conversation with Jamie Forrester"
In Part 2 of our interview with Jamie Forrester, he talks about lobbing Mildenhall, promotion, Hull City, Peter Jackson and the chances of seeing Forrester as a manager one day. Jamie also discusses how much he has enjoyed his Lincoln City career so far and hopes it will be extended beyond this season. As mentioned in Part 1 of the interview Jamie Forrester has won promotion with various football clubs up and down the country. He hopes that Lincoln can be the fourth team he will help win promotion from this division and he said that weren't so different from two of the other teams he's gone up with. "I've been fortunate enough to have achieved promotion 3 times: Scunthorpe, Northampton, Hull. 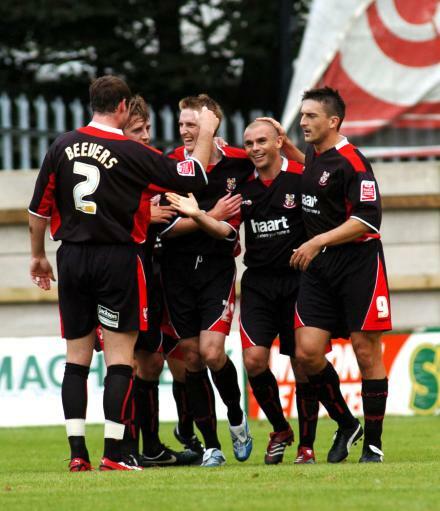 I would say that we are certainly on a similar playing field to what Scunthorpe and Northampton were at the time." Jamie was part of the Scunthorpe team that won promotion back in the 1998/9 season via the Playoffs. That Playoff Final turned out to be his final game for the Iron and he quickly joined FC Utrecht. 12 months later and he was on loan at Northampton Town and he scored 6 goals in 10 games for the Cobblers, securing promotion for the club and a permanent deal for himself. However, he doesn't think Lincoln, Scunthorpe or Northampton can compared to Hull City. "Hull however are a different animal with their location/catchments area allowing them to climb the league ladder in double quick time." 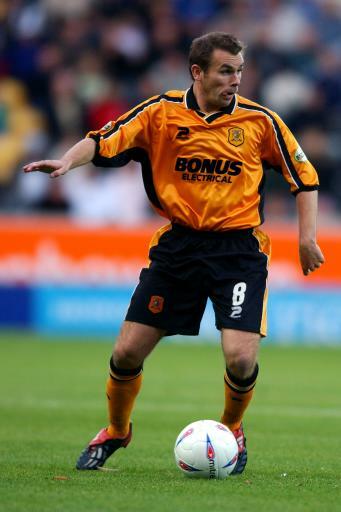 Jamie (pictured right playing for Hull) helped them to promotion in the 2003/4 season after several years of them having midtable mediocrity in the fourth tier. He scored 5 goals that season but was again released. So after a good career, was does he think of his time with the Imps? "I have really enjoyed my time here. Hopefully I will continue to play at Sincil Bank beyond this season. In the time I have been here I have been lucky enough to play in 2 play-off semi's which when you look back, now after the season we have had, maybe everyone at the club took them for granted. This season has certainly not been so successful although it has been a positive season when you consider how many young lads have made their first team debuts. This is all good for the future although I realise that players and fans both want short term success." A relegation battle was an unusual feeling for Forrester but he was happy to have played his part in the recovery this season. "When you look back earlier in the season though I think many people were questioning whether we would retain our league status. From a personal point of view I am very proud of the fact that I played a part in helping us climb to safety. When you are at the bottom of the league and losing on a regular basis it can be a testing time so to fight and come out of that safe from relegation with lots of games to spare is still an achievement." Unfortunately, City are still not mathematically safe due to a run of 5 defeats in 7 games under Iffy Onuora, but realistically we are safe from the drop and the club have already started looking to next season, but Forrester is convinced we've proved we're too good to go down by beating the teams around us. "There have been many matches this season that have been really big games against teams near us at the bottom and to win those games, which we did, require spirit and determination. We showed that. Many other teams in that position have not yet managed to climb to safety and will still have the threat of relegation until the end of the season." Reflecting on his debut against Grimsby Town, another one of his former clubs, back in March 2006 brought back some good memories for the striker and he rated it as one of his best games. It saw him set up a few goals and score one himself following a lob over Mildenhall from about 30 yards. City eventually won that game 5-0 and would go on to face Grimsby in the Playoffs, a mixture of facts Forrester thinks worked against us. "This was one of those days where everything went our way. I could attempt that shot another 100 times and not score. I do think though that this game had a negative impact on our play-off ties against Grimsby. You could sense that they were not going to be beaten like that by us again so soon after." For a few moments at the beginning of that semi final it did appear that Grimsby were still effected by the 5-0 defeat. Jamie McCombe and Marvin Robinson both had efforts disallowed in the first 20 minutes before Grimsby scored the only goal of the first leg, eventually winning the tie 3-1 on aggregate. Forrester wouldn't stop scoring though and he scored 3 hat-tricks last season but once again Forrester was humble and said it was a team effort. "At the time we were winning games quite easily and the team was scoring goals from all over the pitch. I was just fortunate to be on the end of all the chances we were creating at the time. I think that the passing game that John ‘Scoffield' introduced surprised a few teams at the beginning of that season. When we went top teams started to look at us and tried harder to nullify our strong points." "I think our poor form carried over from last season into this season and when you take a couple of heavy defeats at the start of a campaign that can have a big effect on confidence." An excellent observation from the striker as the Imps have conceded 4 goals on nine different occasions this season, a shocking record to say the least. Jamie was very complimentary about his new manager though. "He's a top man. I think he was the perfect man for the job at the time. Everyone at the club needed a lift and he gave players and fans alike what we needed. He's a very vocal person and very passionate with his motivational side of the game being excellent." So that's Jamie's opinion on Jackson the manager.....has he ever thought about Forrester the manager? "I certainly think it is something that I am capable of doing. To become a coach/manager at any club requires you to be in the right place at the right time. I am not saying that you must just be lucky to get a job at senior level but I wouldn't want to put all my eggs in 1 basket by waiting for a job to be offered to me."